Have you ever wondered how nature gets its glow -- who gives it light and color as the seasons come and go? Enter a land of adventure and mystery as Tinker Bell and her four best fairy friends turn winter into spring and, with the power of faith, trust and a little bit of pixie dust, learn the importance of being true to yourself. Adventure awaits Wendy and her brothers when Peter Pan, the hero of their stories, whisks them away to the magical world of Never Land. This year's Autumn Revelry promises to be something special. A blue harvest moon will rise, allowing the fairies to use a precious moonstone to restore the Pixie Dust Tree - the source of all their magic. 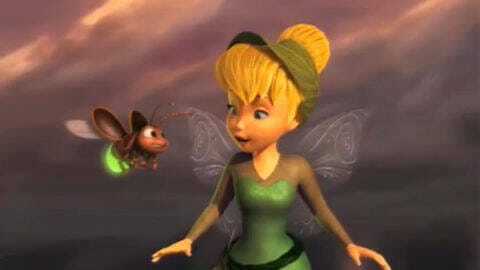 But when Tinker Bell accidentally puts all of Pixie Hollow in jeopardy, she must venture out across the sea on a secret quest to set things right. During the fairies' summer visit to the flowering meadows of England, two very different worlds unite for the first time and Tink develops a special bond with a curious child in need of a friend. As her fellow fairies launch a daring rescue, Tinker Bell takes a huge risk, putting her own safety and the future of all fairykind in jeopardy. Fawn never judges a book by its cover. She is an Animal Talent Fairy who loves all animals. Fast-flying fairy VIDIA is always quick with a clever comment—especially when her friends suggest helping the NeverBeast. Periwinkle is a Frost Fairy who lives in the Winter Woods. She learns that Tinker Bell is her sister when their wings both glow. She is curious and loves to go on adventures. Garden fairy ROSETTA joins the efforts to help the NeverBeast—despite the fact that Gruff is not exactly easy on the eyes. Light fairy IRIDESSA tries to look on the bright side when her friends welcome a forbidden creature to Pixie Hollow.